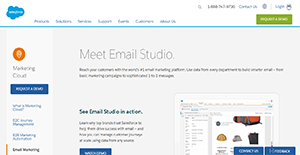 What is Salesforce Email Studio? Salesforce Email Studio is a cloud-based, scalable, and powerful email marketing platform that is a component of the company’s popular Marketing Cloud. It is a leading solution that assists companies in making smarter email campaigns by using data from all departments. With Email Studio, businesses can send emails in bulk, or send them to targeted individuals, or even create one-to-one conversations. This lets companies customize their interactions with their customer base and also lets them personalize their email communications. Additionally, Email Studio provides automation tools that make email send outs, report deliveries, and many other processes less arduous. This enables marketing managers and other professionals more focused on creating and managing campaigns. With Email Studio, businesses are able to segment emails and organize them according to certain characteristics. This lets them create more targeted email campaigns and also saves them time during the send-out process, especially when they have to deal with thousands to millions of emails per campaign. Email Studio comes with a plethora of mobile-responsive email templates that businesses can customize according to their needs. This also enables companies to take advantage of various tools for them to create dynamic messages, such as the use of HTML codes and custom scripts. Furthermore, Email Studio assists business organizations in making their customer journeys more engaging. The application offers them the means to interact with their potential customers and long-standing clients at every stage so they can maintain strong relationships. For businesses to increase their success, they need to send their emails at the right time. That is something Salesforce understands, which is why Email Studio is equipped with automation functions. This lets marketing managers schedule the email send out in advance so that campaigns reach their intended recipients when it is most optimal. Moreover, Email Studio also automates data imports and reports distribution. This enables everyone on the team to save time in transferring data from one system to the other. On top of that, automated reports distribution keeps everyone involved aware of their campaigns’ performances. In order to aid companies in figuring out which tactic works best with their audiences, Email Studio supports A/B testing. This enables marketing teams to send emails to different segments that sport varying approaches. Since each company has specific business requirements, it is advisable for them to abstain from searching for a one-size-fits-all perfect software system. Needless to say, it would be futile to try to find such an app even among popular software applications. The smart thing to do would be to catalog the various essential elements that need consideration such as main features, budget, skill levels of employees, company size etc. Then, you should do your groundwork thoroughly. Read some Salesforce Email Studio reviews and look into each of the other systems in your shortlist in detail. Such comprehensive homework can make sure you weed out ill-fitting systems and select the system that presents all the aspects you need for business success. How Much Does Salesforce Email Studio Cost? Salesforce Email Studio’s SMB and enterprise pricing details can be obtained by contacting the vendor. We realize that when you make a decision to buy Email Marketing Software it’s important not only to see how experts evaluate it in their reviews, but also to find out if the real people and companies that buy it are actually satisfied with the product. That’s why we’ve created our behavior-based Customer Satisfaction Algorithm™ that gathers customer reviews, comments and Salesforce Email Studio reviews across a wide range of social media sites. The data is then presented in an easy to digest form showing how many people had positive and negative experience with Salesforce Email Studio. With that information at hand you should be equipped to make an informed buying decision that you won’t regret. What are Salesforce Email Studio pricing details? What integrations are available for Salesforce Email Studio? Salesforce Marketing Cloud offers two kinds of APIs. Both offer different kinds of connectivity with other apps. For more information, visit the dedicated API page or contact support. If you need more information about Salesforce Email Studio or you simply have a question let us know what you need and we’ll forward your request directly to the vendor.